The course is very tough - train well with hill training or a load on your back, Acclimatise well before the run, get used to the altitude. 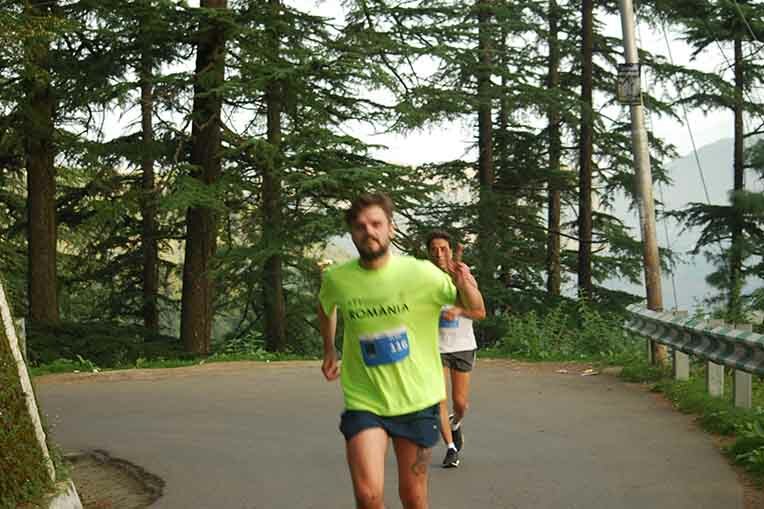 The course starts at the spectacular Ridge at the Top of the Mall and winds down past Historic buildings of Shimla to the scenic PeterHof Hotel. The 6km runners take a U turn from here and come back to finish at the Ridge. The Half Marathoners and the 13km runners go right down to Annadale (and the 25k runners take a 500m detour towards the Glen and return to join the others then and continue to Annadale) on their way to the Peterhof from the Ridge. A continuous descent of 4 km later they see the green golf range and the army museum, and then come face to face with the incredibly steep climb back up - of 1km. Don't even attempt running up - you will needlessly tire yourself out for the latter part of the run. 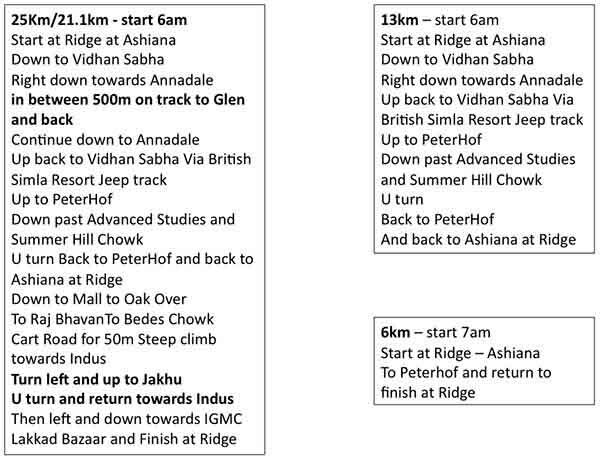 Back up to the Vidhan Sabha and right, past the lawns of the Peterhof and then descend down and go past the Indian Institute of Advanced Studies and onwards past the ITI and close to the HP University- A U turn back, with a descent and then a steady ascent back up to the Ridge. Much walking will be needed and those who have acclimatized well for the altitude will be better off. Walk a lot. 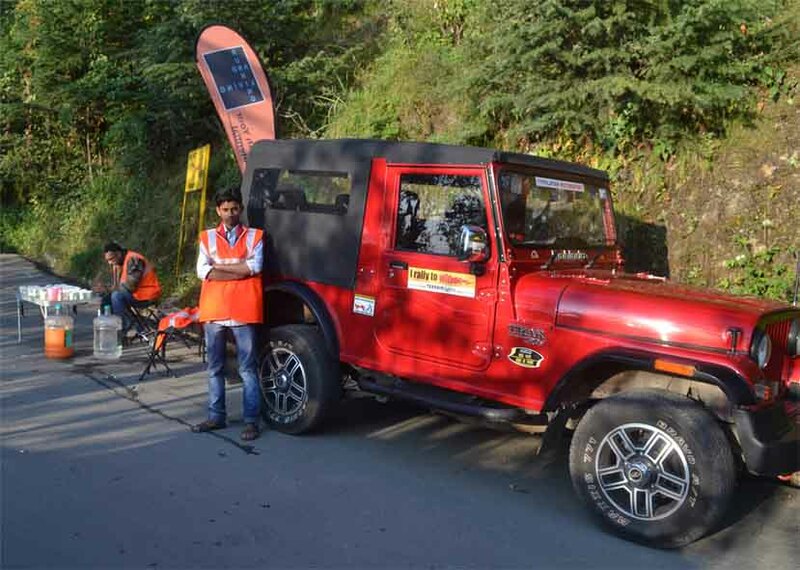 With 13km over you reach the ridge and the most grueling long climb is over. 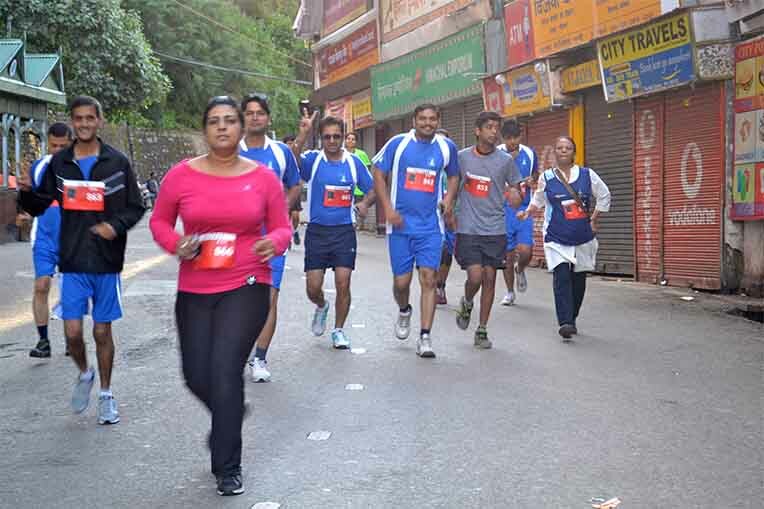 Then starts the 8 km circumference of Jakhu hill for the half marathoners with the tough steep climb to Jakhu for the Ultra Half runners.- Clarke's Hotel - Oak Over - The CM's Residence, then the Governors Residence, then onto Forest Hill Road to Bede's Chowk. 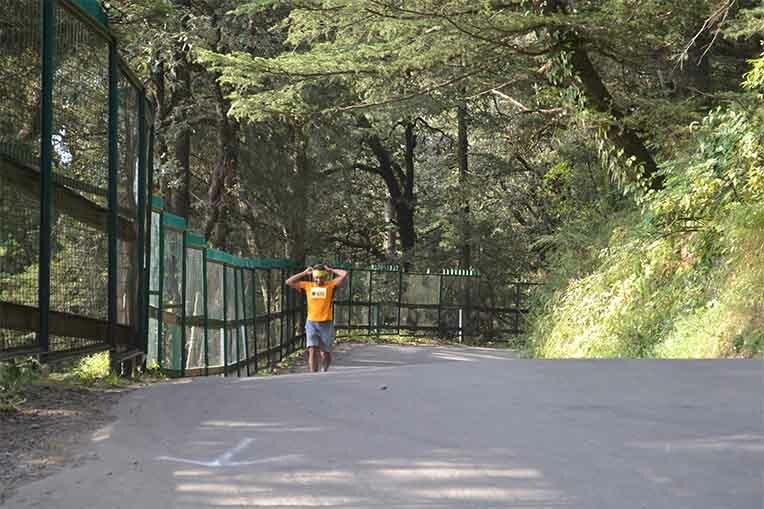 Then on the main circular road for 50m and a steep climb on the left takes you up towards Indus Hospital. It is advisable to walk on this stretch too. 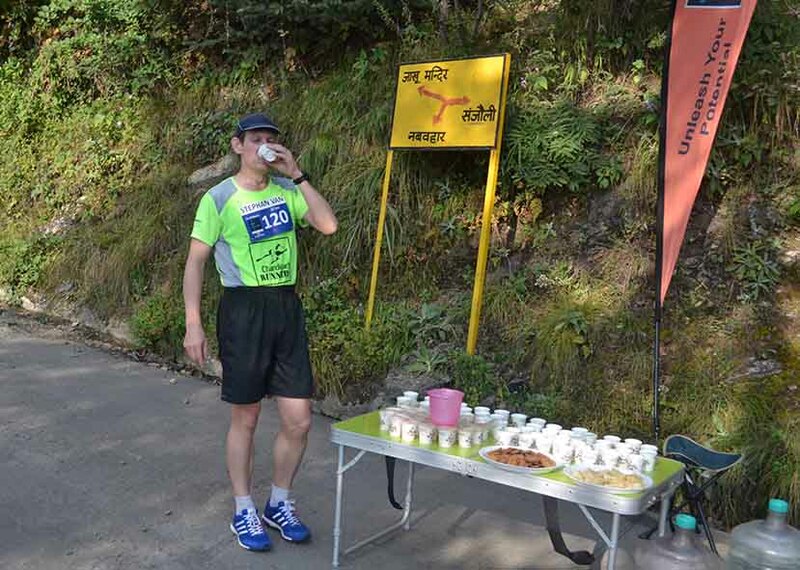 Then it levels off at Upper Sanjhauli and you can relax with a descent down past the IGMC, Lakkad Bazar and a finish at the Ridge, near the Church. 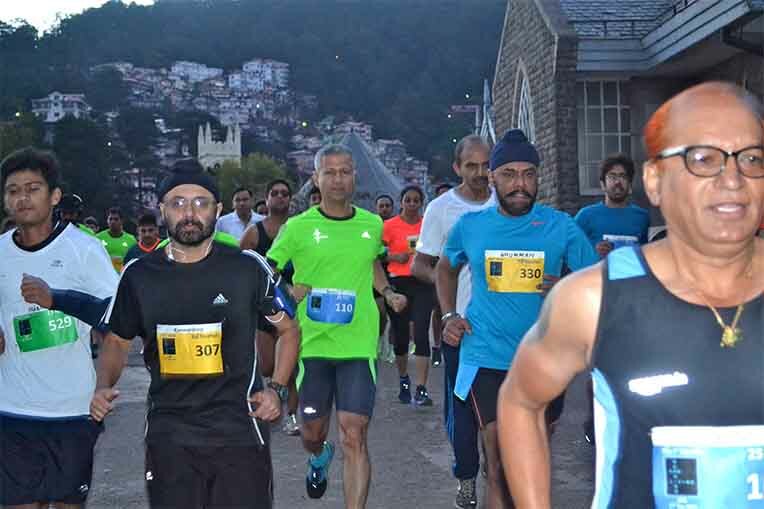 The 25K runners will do a ~1.5km climb from the top of the Indus Hospital climb, to go to the base of Jakhu temple and then run 1.5km down to do ~3km more than a half marathon as they then follow the remaining half marathon route. 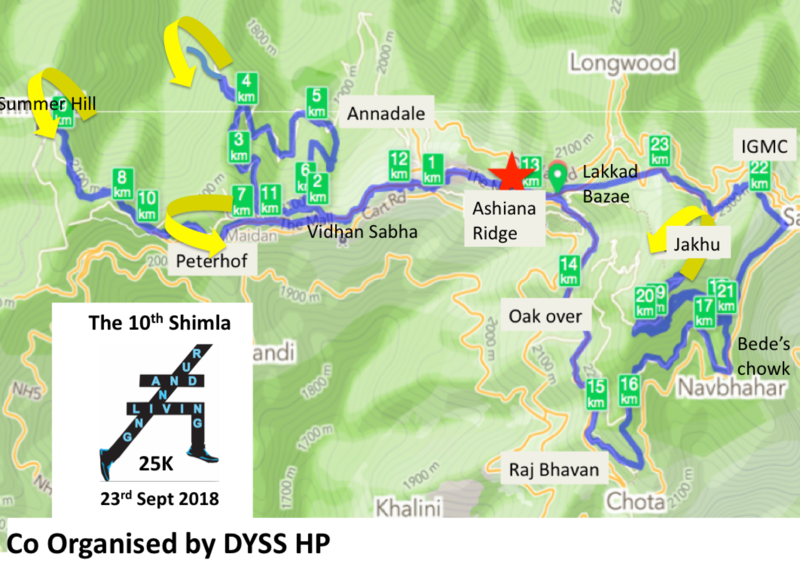 See the Map and the Elevations - come prepared to stay a few days in Shimla before the run - Enjoy the fresh mountain air, the heritage and nature. 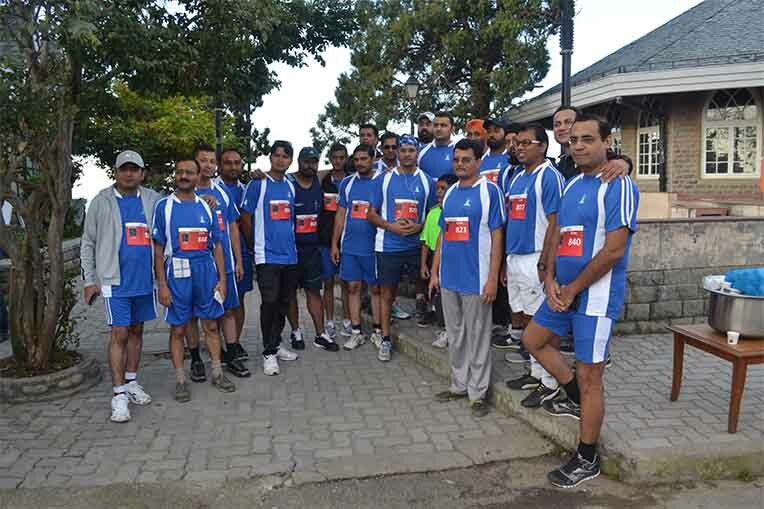 Anyone registering for a our race should make sure that he/she is medically fit and does not have any precondition - however minor it may seem to them, that would indicate that they should not run eg being on some medication, onset of a cold or flu, not yet recovered from a flu or an injury etc. This run has some cross country stretches which CAN have a incidence of ankle twisting, slipping and falling. 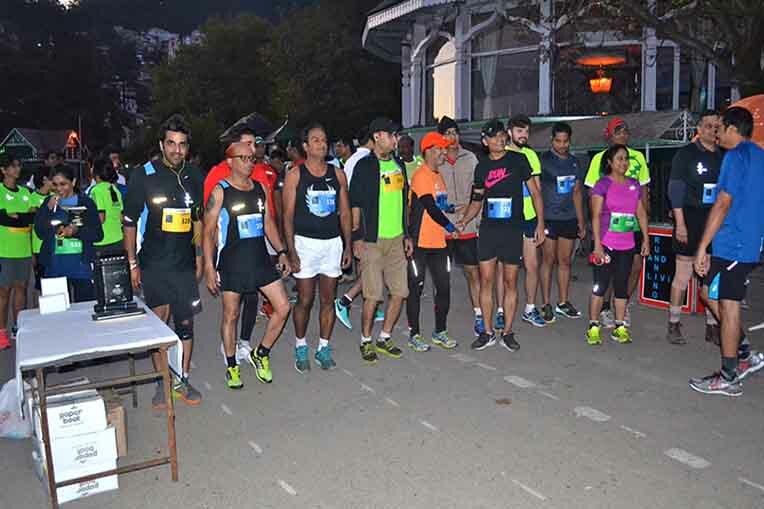 This run is at an altitude of 7500 ft which requires some acclimatization so come at least 2 nights before the run to get used to the change in oxygen levels, and also listen to your body and heart and do not push yourself beyond a limit. Walk when tired. Some runs are in heat and in humidity, and require regular hydration to ensure you do NOT get dehydrated or start cramping. 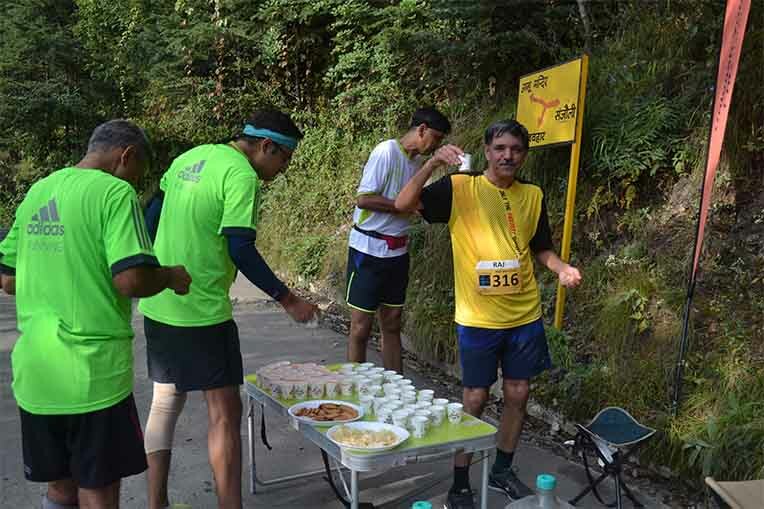 Some runs are in colder weather which should also require some ingestion of salty items - sports drinks or other solids or liquids to prevent cramping. We want you to have fun and stay safe, and do your bit towards that. 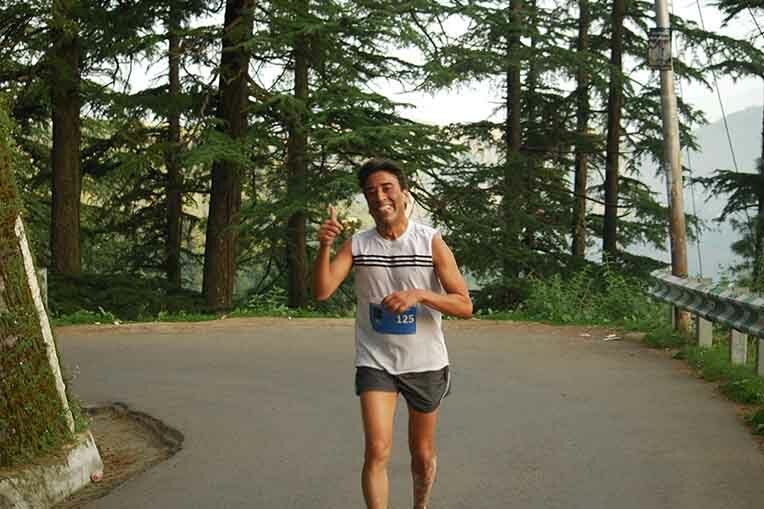 There are last week and last day tips to runners available at Keen Runner. The final 2 weeks:Check out the last 2 week schedule at one of the training programs on our site which suits your level of training and your goals. Remember -train well and you will finish smiling. All the very best and congratulations on your decision. Your entry is not transferable to other people and is not cancellable. You must wear your race bib as issued, pinned on front. Entrants must not be accompanied on the course by people not entered in the event. 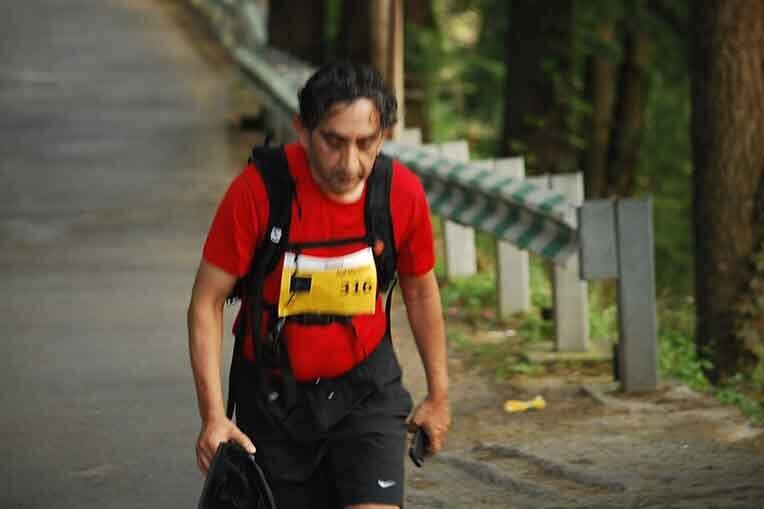 If you do not pick up your bib - then - NO RUN - NO MEDAL - NO CERTIFICATE. There will be information provided on the course. 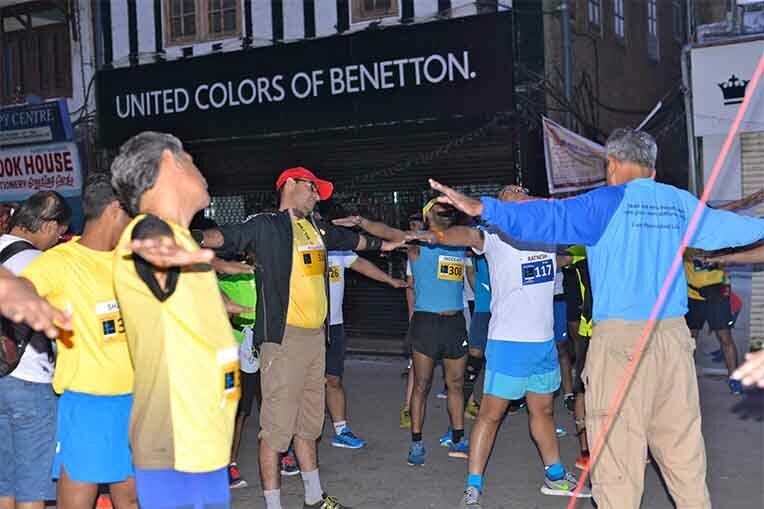 So if you are planning to run, block off some time for coming to the expo - you will get to know the way to the race location and will also meet several other runners and make new friends. Come at the start of the expo to make sure you get as much info and are well rested for the big day and walk on a section of your course. 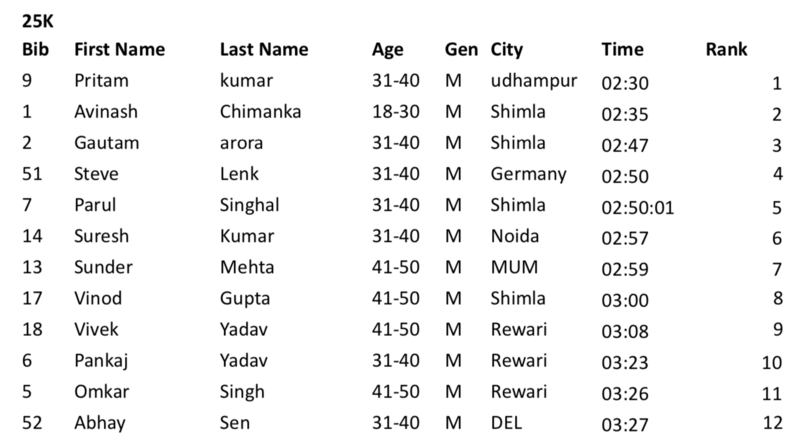 In the grueling 25K Pritam Kumar from Udhampur came 1st in 2:30, Avinash Chimanka from Shimla was 2nd in 2:35 and Gautam Arora from Shimla was 3rd amongst the 12 finishers in 2:47. Congratulations to all of you on a finish in a tremendously challenging course. 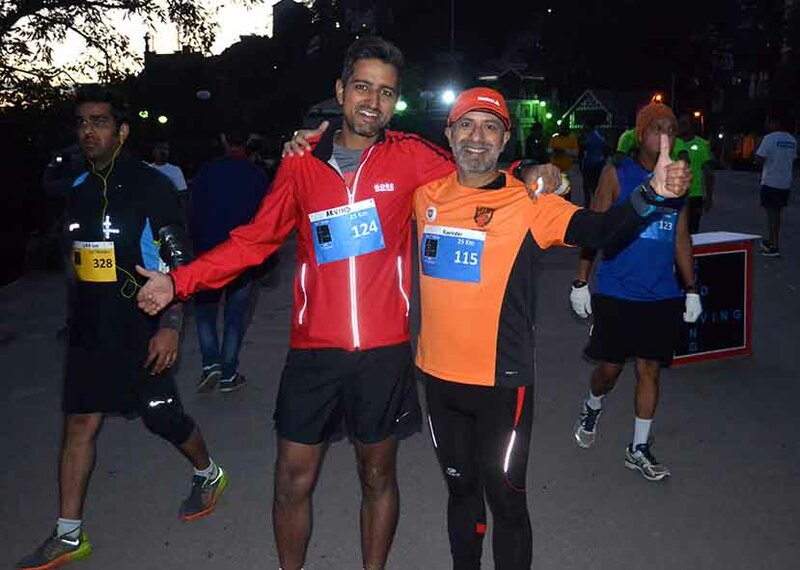 Amit Dalal from Shimla lit the track on fire as he came 1st in the Half Marathon in 1:53, with Amith Limboo from Gangtok on his heels finishing in 1:54. 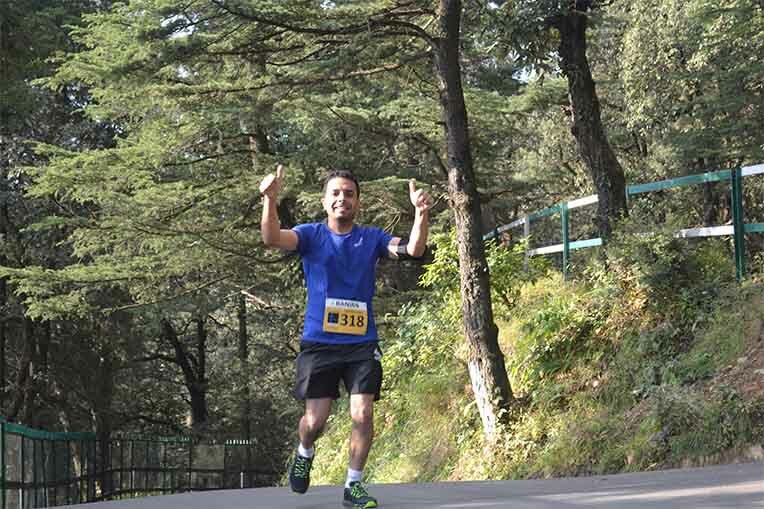 Kuldeep Sandhu from Shimla came in 3rd in 2:17. 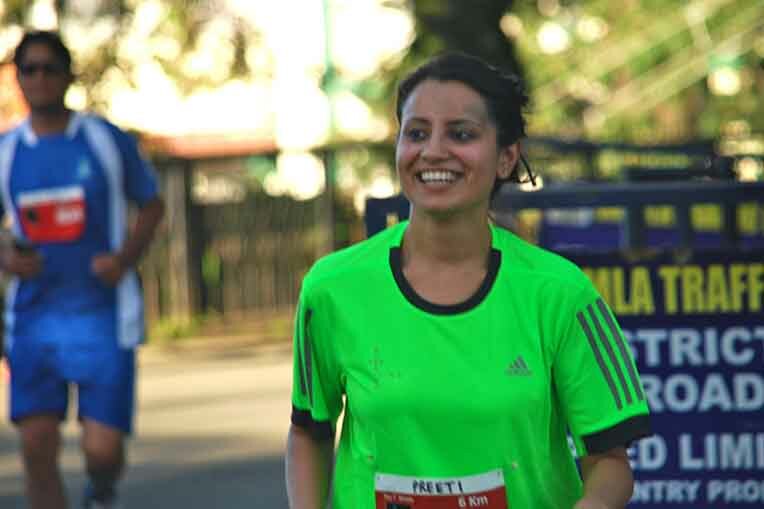 Nandita Rani led the Half Marathon finishers in 3:11, with Bhargavi Nuvvula in 3:47 and Divya Parashar in 3:51 coming in 2nd and 3rd. 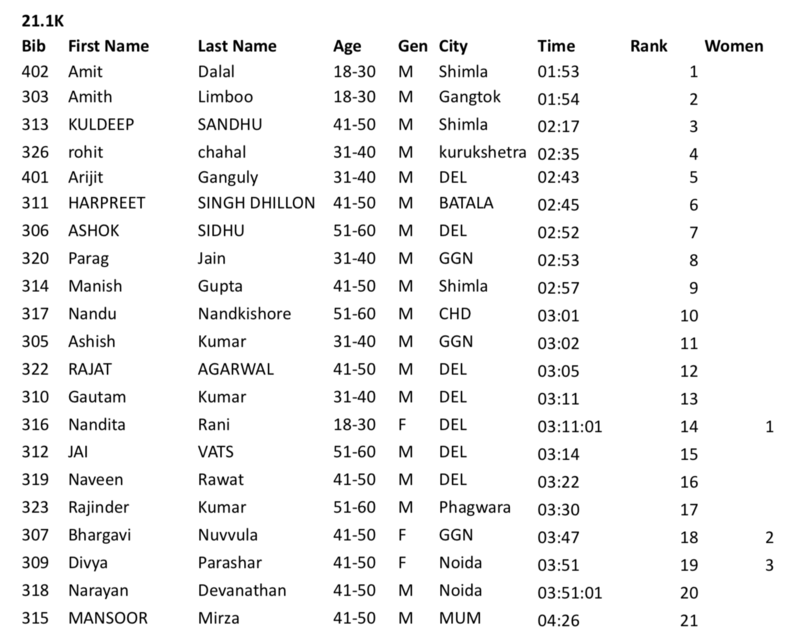 In the 13k Krishna Prasad from Shimla flew in 1:15 with Ajay Chauhan and Jagannath Desai finishing in 1:25 and 1:26. 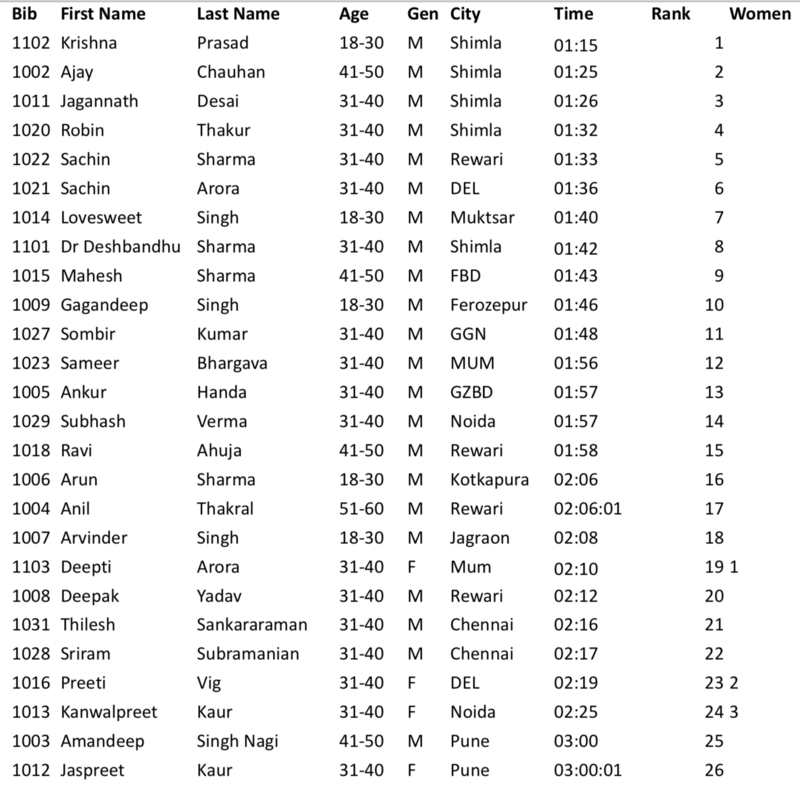 Deepti Arora from Mumbai in 2:10, Preeti Vig from Delhi in 2:19 and Kanwalpreet Kaur from Noida in 2:25 were the 1st three women finishers. 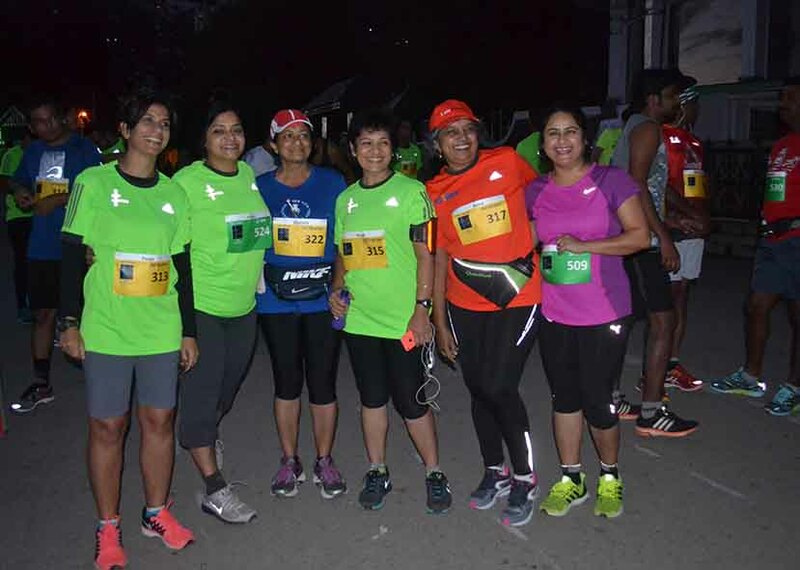 Sushil, Sandeep and Sandip were the first three finishers in the 6k while Disha, Allka and Subidha were the 1st three finishers amongst the women participants. 25.00 KM 23rd Sep 2018, 06:00 AM Online regn closed. 21.10 KM 23rd Sep 2018, 06:00 AM Online regn closed. 13.00 KM 23rd Sep Sep 2018, 06:00 AM Online regn closed. 6.00 KM 23rd Sep 2018, 07:00 AM Online regn closed.